Mr. Scrumptious and I both are self-professed Brussels Sprouts haters. There aren't many foods I abhor but until about a year ago, this is the only way I'd describe what I felt for Brussels Sprouts. What I didn't know, is how healthy they are! This is the time of year they are abundant in the stores and farmer's markets in the U.S. and so there are lots of people out there cooking them. I realize I'm not alone-- there are many of you who grew up with them boiled and just found them to be awful. Me too. But last year I went to a fantastic restaurant that completely changed my perceptions about these little veggies related to cabbages. I learned that Brussels Sprouts themselves aren't evil, immersing them in water and then overcooking them is the problem. They become delicious and subtle when they are roasted and even better if roasted to the point of a little crispy smokiness on the outside yet tender inside and especially when balsamic vinegar is involved. In my homage to the dish I had that night, I swore I would make them and give them another chance. I also had some leftover cranberries from the holiday and thought the tartness of the cranberry would work well with the Brussels Sprouts flavor. I added a few other things and remembered to pair it with a good balsamic vinegar. 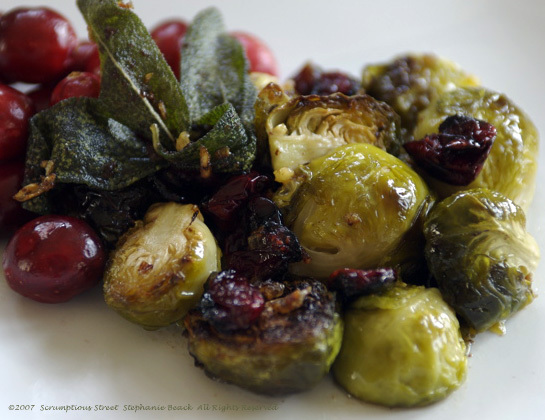 My "Roasted Brussels Sprouts and Cranberries with Sage Balsamic Brown Butter" turned out terrific! 1. Preheat oven to 400˚F. Wash the Brussels Sprouts and cranberries and let drain in colander. Remove any tough or damaged outer leaves from the sprouts. Cut the stems off and slice in half lengthwise. 2. Arrange the sprouts in a single layer on a rimmed baking sheet, with some cut-side down and some cut-side up. Add the cranberries to the baking sheet. Drizzle them all with the olive oil and season with Kosher salt and freshly ground black pepper. Put in the oven and roast for 15-20 minutes, check with a fork, they should be tender inside but not soft. 3. Five minutes before the sprouts are done roasting, add the butter to a small saucepan and melt on low heat. Add in the shallot and sage leaves and increase the heat to medium-high. Let the butter cook and begin to brown and foam, continually swirling the pan for about 4 minutes. Add the balsamic vinegar right before the sprouts are done and cook one minute longer. Remove the saucepan from the heat. 4. Remove the sprouts and cranberries from the oven and pour into a serving bowl. Drizzle the balsamic brown butter over the sprouts and berries and toss with a slotted spoon. Taste and add more salt or pepper if necessary. Remember, that terrible smell we remember from childhood is a result of overcooking and even more malodorous if they aren't extremely fresh. Also, if you overcook them you, yourself will ahem... emit a terrible odor. So, get them very fresh and cook them with gentle care and you will be amazed at the difference. It was a VIKING Thanksgiving at Scrumptious Street!! 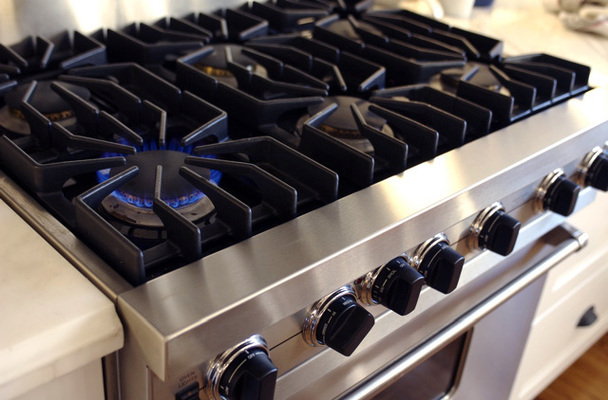 No, we didn't invite any sea-faring traders, rather for the first time ever, I am cooking with a VIKING professional range 6-burner, double-wide with warming shelf. All I can say is this stove/oven is phenomenal and made cooking a Thanksgiving meal so much easier than ever before. But before, I get there, I'd like to introduce the real star of the meal, my "Fig and Sweet Italian Sausage Rosemary-Sage Dressing". This dish, unanimously voted the Scrumptious favorite, was so much better than even I had anticipated. It was full of wonderful autumn-holiday flavor, crackling with crispy edges, moist and hearty, slightly sweet, delicately spiced. I attribute a large part of the success to the wonderful bread I used, baked fresh by a local bakery. If you can get a similar round or loaf, it will really produce spectacular results. It's also wonderfully simple, so a real bonus when you're making multiple dishes. By the way, I really don't care for "stuffing", so I always make dressing. I like the texture better, and I like the crispy bits with the moist bread. If you want to make stuffing out of this, it would also work well. I just stuffed my turkey with herbs, onions, carrots and apples. 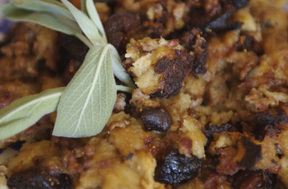 Here is the recipe for the best dish of Scrumptious Thanksgiving 2007. 1. Slice the crusts off the bread if desired and dice into cubes. Leave out for a few hours in advance to dry out slightly. Preheat oven to 325˚F. Spread the bread cubes in a single layer on a baking sheet and toast for 20 minutes, stirring once. Remove from oven when toasted and let cool. Increase the oven temperature to 350˚F. 2. 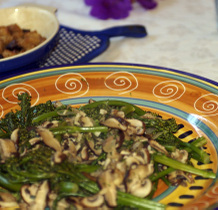 Heat the olive oil over medium-high in a medium skillet. Add the onion and 2 whole sage leaves and sauté until the onions are translucent, about 4-6 minutes. Add the figs and toss until coated. 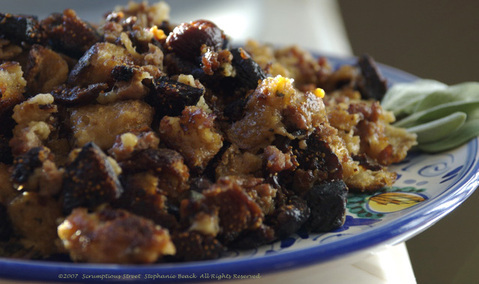 Remove from heat, take out the whole sage leaves and set the onions and figs aside. 3. Add the stock to a saucepan and gently bring it up to simmer. 4. Add the sausage to the skillet and sauté, making sure to break sausage into fine chunks and cook until brown on the outside and very little pink inside. It should be browned as you would ground beef but slightly longer. Remove from heat when cooked through. Drain any excess fat from the sausage. 5. Place the bread in a very large bowl. Add the fennel seed, the minced sage, onions and figs and the sausage. Mix gently with a spoon. Slowly add the stock, adding one cup at a time until the bread is completely moist but not soggy. Depending on your bread, you may need slightly more or less than 3 cups. Make sure all sides of the bread look coated, but not too wet. Taste and adjust seasonings with a little kosher salt and ground black pepper. 6. Spread the dressing into a heavy, dark baking dish and cover with aluminum foil. Bake for 35 minutes covered. Remove the foil and bake 10 minutes more, until crispy on the top and edges. Serve immediately! This dressing was truly a hit, but part of the fun was using the new stove to make everything. The entire menu was as follows: Roasted-Herb Turkey with Gravy, Fig and Sweet Italian Sausage Rosemary-Sage Dressing, Roasted Sweet Potatoes and Chestnuts with Apple Butter, Sauteéd Broccolini and Shiitake Mushrooms, Cranberry-Tangerine Compote, and for dessert Blood Orange and/or Blackberry Sorbet. If you've been a Scrumptious reader since the blog's inception, you'll know that I started it when I moved from a tiny apartment kitchen in New York to my first real kitchen in New York. This summer, we moved to Northern California, and now I'm in a house nearly triple the size of our apartment, with an entire room called a kitchen and this incredible stove. Even though my Bosch in New York is very good, this stove inspires awe. The heat is so uniform, so easy to control and it gets to temperature in the blink of an eye. This is also true with the oven. It's a great difference to have what I call a "double-wide" I can fit more pans in much easier without over-crowding or seriously reducing cooking temperature or increasing cooking time. I love this thing! We will all benefit from this; you the readers, Mr. Scrumptious and I! Now there's something I never had in New York. 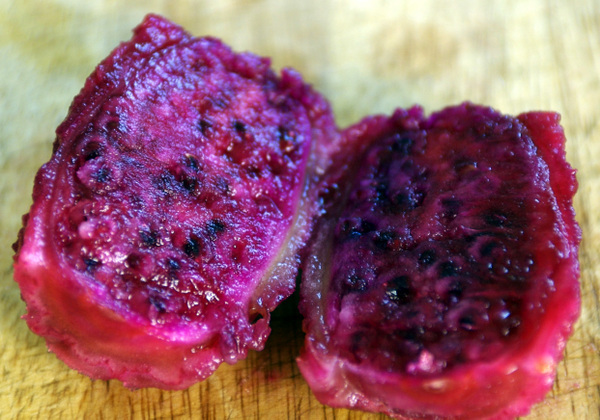 Prickly-pear cactus fruit. 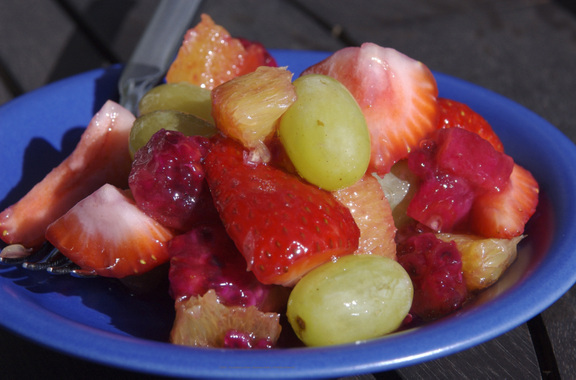 It made a gorgeous and very delicious Sunday brunch fruit salad, when combined with some other fresh produce from the farmers at a stand within 20 minutes' drive. California rocks: it's November 11 and today I bought fresh strawberries that are still nearly as good or better than what I used to get during peak summer season in New York. Oh, and we ate outside on our deck in 70-degree weather. Yes. On November 11. As the most devoted of Scrumptious readers know, the last three months of my life have been fraught with change, rest, and misery. 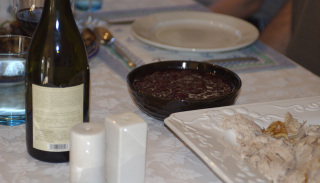 It has taken a very, very long time to transport our lives cross-country and I have spared you the gory details, because, well, this is a cooking blog. And, I have been so ensconced in turmoil and loss that I haven't done much cooking. There have been good moments, and a spectacular vacation, but for the most part moving has been a huge detriment to my cooking, for many reasons. Well, dear readers, we are nearing the end of my hiatus. This weekend, Mr. and Mrs. Scrumptious moved into a super-fantabulous-house with a to-die-for-kitchen and (GASP, ARE YOU READY?) A HOME-PROFESSIONAL STOVE. The real deal. 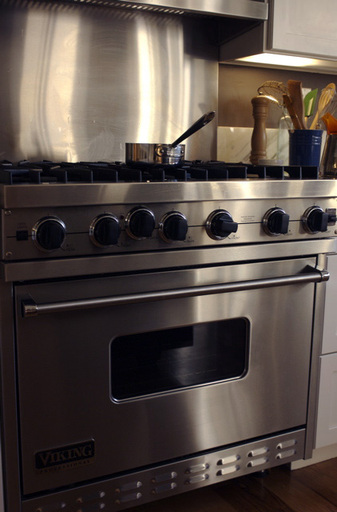 The six-burner Viking with warming shelf and double-wide oven with three racks. No, not the double-oven...that will only come when we move into a house in which I designed the kitchen! But, for a rental house, this is pretty friggin spectacular. We only moved in this weekend, so I'm not really cooking on full burners yet as the house is still mostly in some state of unpacked and nicely organized. Mr. Scrumptious did point out that the kitchen was the first to get attention. Alas, he is right. I claim it's due to wanting the movers to unpack everything and check for breakage and well, I needed to put things away as they unpacked to make room for the bazillion other boxes, right?! So I apologize for not cooking and shooting and blogging some real cooking. But, I'm not settled quite yet. Only another few days and I should be rearing to go. You have all been so patient, thank you! We're almost there. 1. Wash and clean all the fruit. 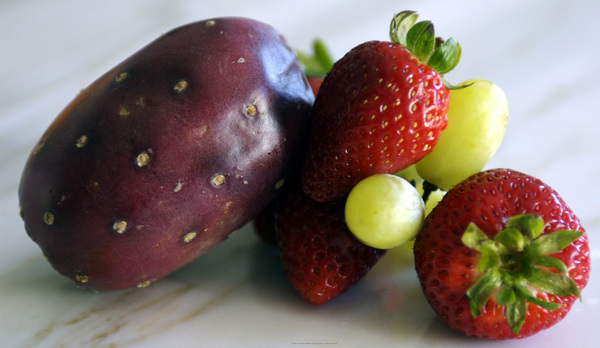 Peel the prickly-pear cactus fruit. Chop into pieces but leave grapes whole. Peel the orange with a knife and segment the supreme. Remove all the pith. 2. Place all the fruit in a bowl. Squeeze the juice from the orange left-overs over the fruit. Mix gently with your very clean hands. 3. Drizzle the honey over the fruit. Sprinkle the cinnamon over the fruit and toss gently with a spoon. 4. Serve immediately and enjoy but beware the seeds of the prickly-pear. They're quite robust.